I now live in the south of Sweden; but, in the 60s and 70s, I lived in Stockholm. I've worked as a journalist and photographer for almost 30 years. I'm also a writer and have had four books published - with mostly nature photos. I am a member of the Swedish organisation Nature Photographers. I remember that Irwin visited Sweden again two or three years later and I took some pictures once more, this time at the airport. He seemed to be a very nice and kind person. While in Sweden, he visited some churches and spoke of his experiences on the moon and about the High Flight Foundation. I thought it was very interesting because I have always been interested in spacecraft, astronauts, and the Moon missions. Especially Apollo 15 after I met Jim Irwin. I am now retired. 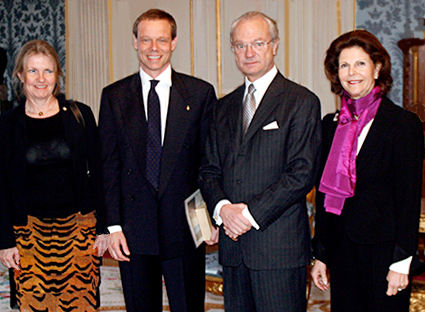 Recently, when I heard that the Swedish astronaut Christer Fuglesang, who did succsessful spacewalks in December 2006 (STS-116 Discovery), would meet King Carl XVI Gustaf and Queen Silvia at the Palace in Stockholm, I sent an e-mail to the press secretary with a link to the ALSJ website and the photo I took in 1976 of the King with Jim Irwin and his daughter, Jill. The press secretary, Morgan Gerle, thought it was very interesting and invited me, together with eight other photographers, to the Palace. I was informed that only one minute was alotted to the photo session! I live in the south of Sweden and would have to fly to Stockholm and back for that one-minute opportunity. However, my father and my brother and his family live in Stockholm, so I could visit them, too. The photo session was at 11.00 am and I was asked to be there 45 minutes earlier. When I arrived, the guard asked my name. He made a phonecall and a fax arrived. He read it and said: "Carl-Gustaf Edhardt, NASA." I was a bit surprised, but smiled and said yes. He thought I was representative of NASA. Morgan told me later that this had been his own idea. A very nice person. I had made a copy of the black & white 1976 photo and, while Morgan showed me around in the left wing of the Palace, he said we should show it to the King. Well, I did not think there was time or opportunity for that. At 10:45, the other photographers arrived and, at 11:00 sharp, Christer Fuglesang and his wife, Lisa, and the King and Queen arrived. They greeted each other and, after the one-minute photo session, the photographers were sent away. Only the press secretary and I, the "NASA representative" remained. Morgan took away the temporary barrier that had kept the photographers out of the seating area; and the King and Queen and their guests sat at a three-piece suite. 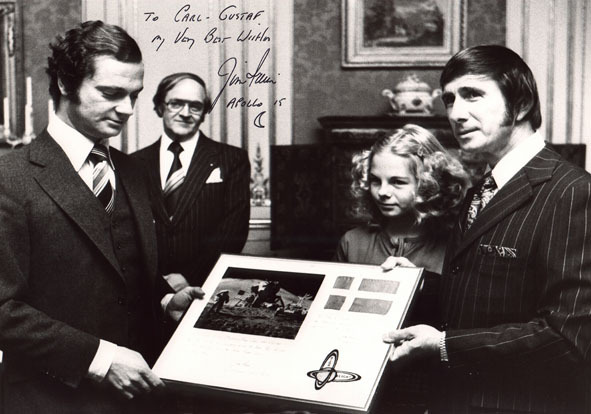 Morgan presented me to the King and showed him the copy of the 1976 photo. The King thought it was interesting and asked me who the astronaut was. He had forgotten. I told him about Jim Irwin being the Lunar Model Pilot on Apollo 15 and the 8th man on the Moon. Christer Fuglesang was also interested. At the same time I took some pictures that no one else got. A very nice experience for a retired photographer. Thanks to NASA! 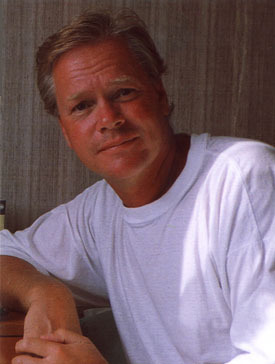 Editor's note: King Carl XVI Gustaf was born in 1946 and succeeded his grandfather to the throne in 1973. The King and Queen married in June 1976. Lisa and Christer Fuglesang (left) with the King and Queen during the one-minute photo session. The King examines the 1976 Irwin photo. Christer Fuglesang is on the right with mementos from STS-116, which he will present to the King and Queen. Lisa Fuglesang is seated just out of the frame, to the King's right. 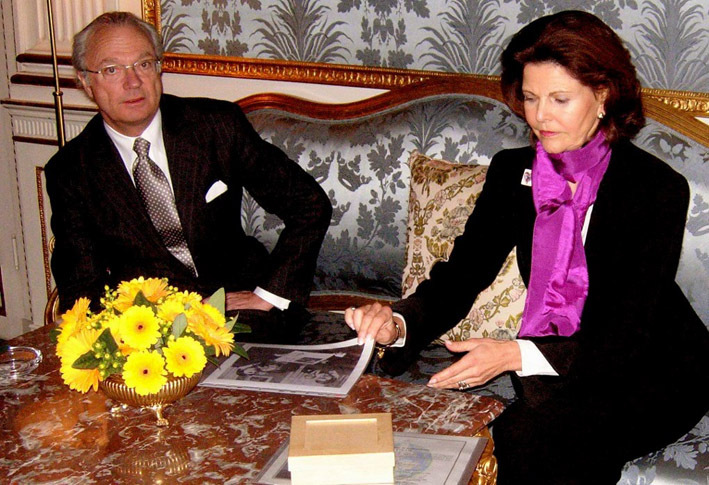 Queen Silvia prepares to examine the 1976 Irwin photo. 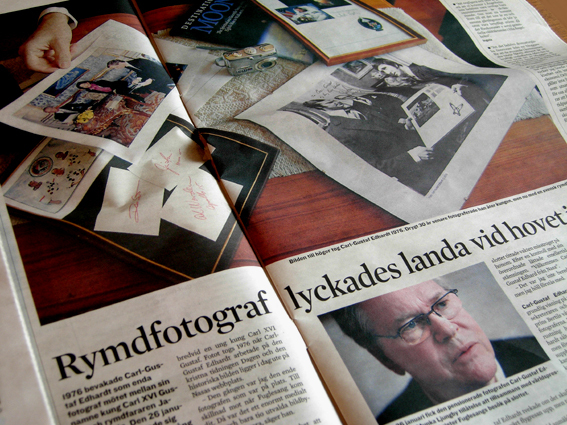 Swedish news story about Carl Gustaf's two visits to the Palace.